Behind every politician there are men and women working in the wings, who can make calls, fix problems, raise money, punish enemies. In Rick Perry’s world, one man stands above them all: Mike Toomey. In Rick Perry’s world, one man stands above them all: Mike Toomey. Intense and reclusive, Toomey is not well known outside of a few square blocks around the Texas Capitol. But within them, he is respected and feared for his keen intellect, tough political tactics and his longstanding partnership with the longest continuously serving governor in the United States. Should Perry, who is seeking the Republican presidential nomination, reach the White House, it will be in no small measure because of the efforts of Toomey. A lobbyist, former legislator and onetime chief of staff to the governor, Toomey has tapped a sprawling network of donors, business allies and friendly (or indebted) lawmakers to help Perry accomplish ambitious political and legislative goals. A patron to Perry from the governor’s first days in the state House of Representatives, Toomey has bolstered and profited from Perry’s power, embodying what critics call an insider pay-to-play culture. Toomey’s clients have won $2 billion in state government contracts since 2008, a joint analysis by The Texas Tribune and The New York Times found. Toomey has turned his success on behalf of his clients to Perry’s benefit, funneling their political donations into groups that have helped strengthen both his legislative majorities and his re-election efforts. Campaign finance laws have often allowed Toomey and his clients to obscure their involvement. Toomey is playing much the same role now as Perry moves to a national stage, which could prove especially important as Perry looks to get his campaign back on track. The Perry campaign is pinning its hopes on a major grass-roots drive and an advertising blitz. The scope of that effort is likely to be rivaled by a parallel pro-Perry operation being run by Toomey. His group, an independent political action committee called Make Us Great Again, has a proposed $55 million budget, and under federal rules can spend unlimited funds as long as it does not coordinate with the campaign. Seeking to avoid any appearance of coordination, Toomey is keeping his distance from the governor, a hiatus in a long relationship that offers a glimpse of how Perry has operated as governor and, perhaps, how he would manage the presidency. Toomey’s multiple roles in Perry’s orbit have become lore here — overblown “folklore,” Perry’s aides argue. He is Perry’s friend. They worship at the same affluent mega-church. And when Perry bought a chunk of land, it was Toomey who signed the papers for him while Perry was unavailable. He is part adviser and part enforcer. One lawmaker, in an interview, recalled Toomey summoning him to the governor’s office to tell him if he did not vote a certain way he might be on the receiving end of a business-backed campaign to oust him. 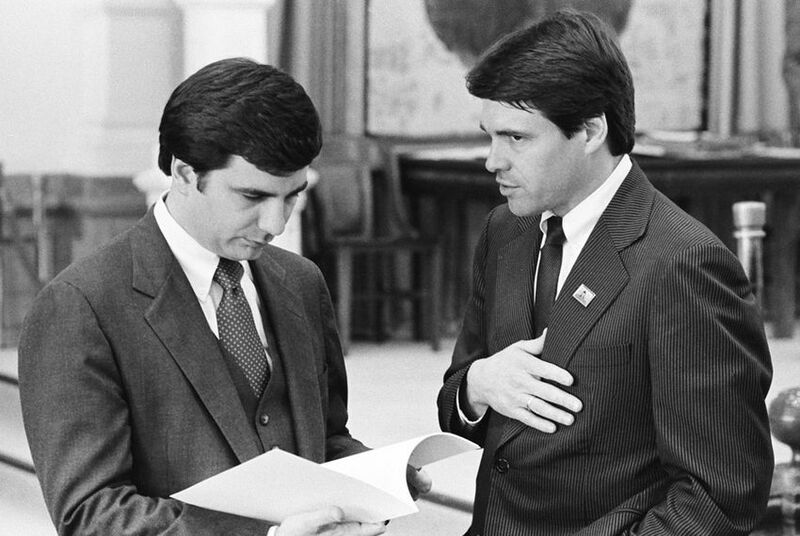 When Perry entered the Texas House in 1985, Toomey was there looking for converts to his gospel of smaller government and low taxes. He found a willing adherent in Perry, a West Texas conservative Democrat. The conversion that began in the House led Perry to switch parties and successfully challenge the liberal firebrand Jim Hightower for agriculture commissioner. The success of that campaign put him in position to run for lieutenant governor on the ballot with George W. Bush in 1998. Toomey did not follow his friend into the lieutenant governor’s office, but his presence was palpable. “Rick Perry had a kitchen cabinet that was outside and the leader of that outside kitchen cabinet was Mike Toomey,” said Hector Gutierrez Jr., who was then a senior adviser to Perry for legislative affairs. Toomey was already a fixture in the corps of special interest representatives in Austin, known simply as “The Lobby.” Such was their influence that their seating area in the House was called “the owners' box.” When Bush was elected president and Perry became governor, Toomey also received a promotion of sorts: He became one of the most powerful lobbyists in Austin. Perry and Toomey, both 61 now, shared a small-government philosophy they had honed in the Legislature, as did many of Toomey’s clients. Supporters argue that their symbiosis was more ideological than transactional. Both as a lobbyist and as Gov. Perry’s chief of staff, Toomey played a big role in helping create what the governor has promoted as his state’s business-friendly climate. He was widely credited with pressing the Legislature to pass Perry’s signature bill capping the amount some plaintiffs could win in lawsuits — which Perry regularly mentions on the campaign trail. One of Toomey’s lobbying successes came during Perry’s first legislative session as governor. The Legislature had passed a bill speeding insurance payments to doctors and hospitals and governing how billing disputes would be settled. Perry had spoken favorably of the prompt payment provision, but at least two of Toomey’s major clients opposed the legislation: the health insurer Cigna and a group called Texans for Lawsuit Reform. Among the powerful backers of the group was Bob Perry (no relation to the governor), a homebuilder and big Republican donor. When Toomey became Perry’s chief of staff in 2002 that November — after effectively parking his lobbying clients with colleagues — Ross said it was made clear to the medical association that it would be shut out at the executive branch if he remained its chief lobbyist. Longtime antigambling activists were surprised. Weston Ware, a leader of Texans Against Gambling, said that back in the 1980s, both Toomey and Perry were reliable votes against gambling. Toomey worked as a lobbyist for Sam Houston Race Park in 1998, records show, and Ware said he suspected that Toomey had helped sway Perry. “I think that when he was really tempted, okay, the tempter was Toomey,” he said. Records show that in February 2004, Perry’s campaign received tens of thousands of dollars in donations from gambling interests, including $50,000 from the owner of Sam Houston Race Park. The plan failed with the Legislature nonetheless, and Perry forswore it. Shortly after leaving the governor’s office later that year, Toomey signed on as a lobbyist for a concern seeking video gambling rights, Big City Capital, and lobbying records show he also picked up Sam Houston Race Park as a client once again. Friends say there is nothing improper in the way that Toomey operates. And aides to Perry note that Toomey has not always been successful. In 2005, U.S. Oil Recovery was opposed to a bill requiring permits for waste disposal companies using the public sewage system. It hired Toomey and a company executive told the Austin American-Statesman, “I’m hoping he can get it vetoed.” Perry signed it into law. Toomey has turned his robust lobbying business into a political force in the state, driving the interests of the Republican Party in general and Perry in particular. He was an important strategist in the effort credited with delivering the state House to the Republicans in 2002. Toomey raised one-third of the donations to a group leading the effort, the Texas Association of Business, from clients like AT&T and Cigna and United Health Care of Texas and others. The extent of his role and the identity of the donors was revealed only in the course of legal action by Democrats accusing Toomey and others of improperly using corporate funds to defeat them. Toomey denied wrongdoing and it was settled out of court. While Toomey has frequently operated in secret, he has not always been shy about letting political rivals know the moneyed forces at his command, at least according to former state Rep. Tommy Merritt, a Republican. Merritt said Toomey summoned him to his House office in 2004 and warned that he could “call the six richest people in Texas and take me out” unless Merritt supported the re-election of the sitting House speaker and Perry ally, Tom Craddick. “I did what he asked,” Merritt said. The lawmaker said he got something in return: Perry’s endorsement for his House seat. During Perry’s re-election campaign in 2010 Toomey enlisted a recent college graduate, Garrett Mize, to entice Green Party members to put up candidates in elections, which would potentially divert votes from Democrats. In his deposition in a case brought against the Green Party by Democrats, Toomey acknowledged hiring Mize, whom he paid with personal checks. Sam Bacarisse of The Texas Tribune contributed to this story.